Use of the word Harley or Harley-Davidson® is provided for reference only. Products appearing on this site are not licensed or endorsed by Harley-Davidson®. Most spoke kits for Harley Davidson stock type hubs are available in pre-packaged kits at discounted prices. We make these kits in Standard Round spokes and Design spokes. Prices for the Design kits include polishing. Pre-packaged Design kits may also be ordered by part number via telephone. Design kits not offered as pre-packaged will be at our regular prices and must be ordered in writing. We are discontinuing our pre-packaged chrome and design spoke kits for Harley Davidson hubs. Kits listed are available while supplies last. As always, if your kit is not here, it is available Made-To-Order at our regular prices. We have discontinued our Serpentine Spoke. Our Tortoise Shell is a nice substitute. Any Design not listed below in a pre-packaged kit can be Made-To-Order for your hub. 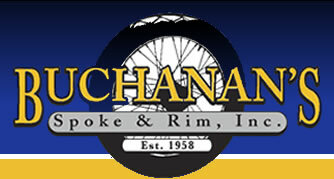 Other spoke kits for these hubs, such as chrome or design spokes, are available made-to-order at our standard pricing. Some of the following kits are available in HEAVY DUTY 5-8 gauge spokes. 16", 17" and 18" rims. We recommend these for the rear wheel of heavily loaded or high horsepower bikes. Note: Rear wheels must still be torqued to 80" lbs. Kits not listed below can be made to order with standard pricing. Used on all XL'S and FX'S (excluding FXWG). Laces all inside, and uses two different bends. FXLR hub (with staggered holes) laced to a 19" deep drop center rim uses a custom kit with standard pricing. NOTE !!! Please thoroughly inspect for cracks around spoke hole area. This is a very fragile hub. High zinc content cast aluminum alloy. Hub is all inside laced.